Lu Xun was born in 1881 in Shaoxing, a beautiful city south of Shanghai, famous for its yellow wine. A family of scholars, a magnificent family home, a traditional education shortened by his grandfather’s problems with the police and his father’s illness . He had to choose free engineering schools, where he was tought foreign languages. With a scholarship, he studied medicine in Japan and suffered a marriage arranged by his mother with an illiterate woman with bound feet. Surrounded by passive compatriots he decided to try to cure minds rather than bodies, and after five years, he abandoned his medical studies for literary and political activities in Tokyo. He returned to China and only thirty years old, he is appointed teacher in Shaoxing and Beijing. In 1918, his short story “Diary of a Madman” in spoken language, is an immediate success and is a landmark for the birth of modern Chinese literature. The demonstrations of May 4, 1919 had a considerable influence on Lu Xun. The short stories, that Lu Xun wrote during this period, are published in 1923 in the book “Cries”. Sebastian Veg, fellow of Ecole Normale Supérieure and associate researcher in Hong Kong, has provided a new translation, with critical reviews of high-quality . It is his most famous book; six of the fourteen short stories were part of the program for Chinese schoolchildren. During many years, “Cries”, was considered a manifesto, a piece of “litterature de combat”, a realistic and cynical approach, a denunciation of the Confucian system. 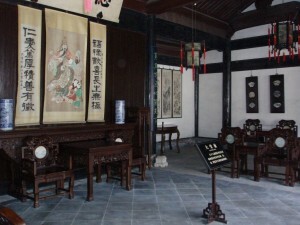 Scholars wanted to forget the disappointment that Lu Xun expressed in his Foreword: having no more illusions about the power of literature; nevertheless, the writer suffers from loneliness and hides himself in the villages of his dreams which he mentions in beautiful pages “The Opera” and “Birthplace”. “The inspiring story of Ah-Q” is primarily a pastiche of hagiographic biographies of the mandarins, but Ah-Q is a nobody with no real civil status. A symbol of the national character of the time, Ah-Q turns defeats into moral victories, he is servile, demonstrates duplicity and crushes weaker fellows than himself! The reaction of his fellow citizens to his execution does not bring optimism for the future ! Written later (1924 -1925), some topics have already been touched: the very negative evaluation of traditional medicine (which caused the death of his father), the beauty of his home country and a harsh criticism of Confucian followers. He supports relaxed morals in particular vis-à-vis widows and specially unmarried young people living together (in “Regrets”). Lu Xun himself began to live openly with his student Xu Guanping in Shanghai as from 1927 (their letters have been translated in English some years ago). His criticism of the intellectuals in the May 4 Movement, underlines that nothing has fundamentally changed and that modernity is often a fad or a social strategy. Also is it legitimate for the intellectual to awaken minds enslaved by tradition and manipulated by the authority of the elders? Other collections of stories have been published in French: ” Morning flowers gathered at night,” translated by François Jullien in 1976, “Ancient tales written in a modern way” in 1978. In 1927, Lu Xun moved to Shanghai where he remained until his death in 1936. He publishes magazines and many translations, founded the Chinese League of Liberal writers in 1933 and participated in the establisment of the Chinese League for human rights. His political essays are marked by a strong opposition to the nationalists but also by an often “leftist” critical approach to the positions of the Communist Party and some of its leaders. He is a demanding partner even if he has never been a Communist. Therefore, after the Communist victory in 1949, in all cities and chines schools will develop museums, statues, birthdays and references to Lu Xun. During the Cultural Revolution, he had his own little Red Book “Quotations of Lu Xun”. In 2007, his texts are gradually removed from the curriculum, too difficult, too much related to a certain historical period, but perhaps also too critical and too pessimistic. Young writers are divided: Zhu Wen saw him as an old relic like the literary prize bearing his name; Yiyun Li considers she owes a lot to him (In her Afterword in the translation by Julia Lovell for Penguin). In France, Lu Xun was translated early. Already in 1979, Presses de l’Ecole Normale Superieure publish a text by François Jullien “Lu Xun Literature and Revolution”, related to his thesis and his translations. Lu Xun was again taken over; followed a bitter controversy in 1975 between Michelle Loi and Pierre Ryckmans ( Simon Leys) who criticized her approach. We should not forget that Simon Leys, almost alone, had the great merit of understanding what was actually the Cultural Revolution and had the courage to write it. 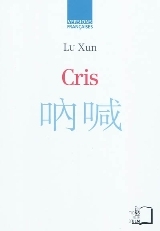 ► Lu Xun, “Cris”, translated by Sebastian Veg. Editions Rue d’Ulm, 2010, 350 pp, 20 €. ► Lu Xun, “Errances”, translated by Sebastian Veg. Editions Rue d’Ulm, 2004, 350 pp, 23 €.